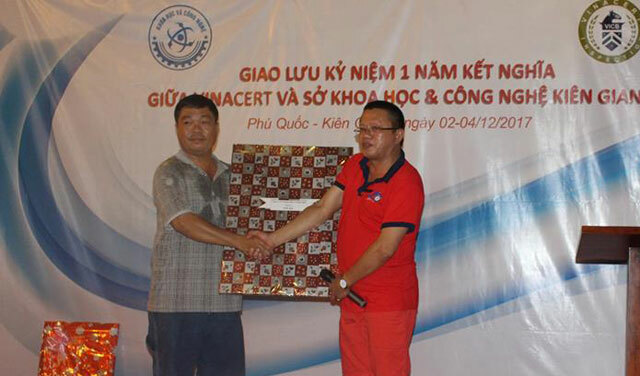 In 03 days from 2nd December to 4th December 2017, VinaCert branch in Can Tho and Department of Science and Technology in Kien Giang province organized a program to celebrate 1 year anniversary of swearing brotherhood, exchanging professional skills and constantly expanding the cooperation in activities. 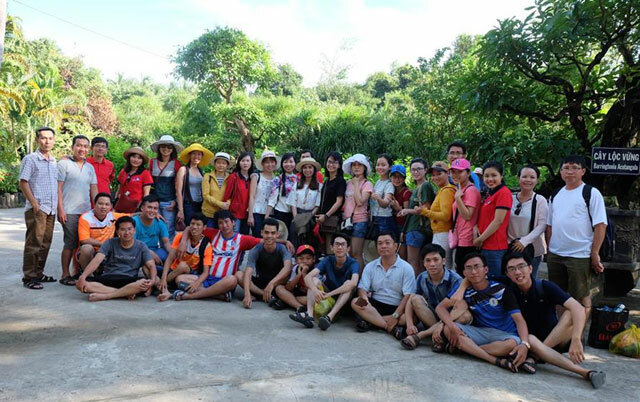 The meeting place of the program was Phu Quoc, where is called Ngoc Island, the largest island in the population of 22 islands of Phu Quoc island district, Kien Giang province. 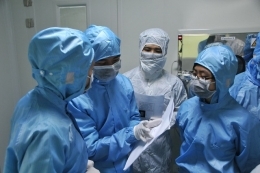 Here, the members of 2 units organized many useful activities to further strengthen the cooperation between the members. 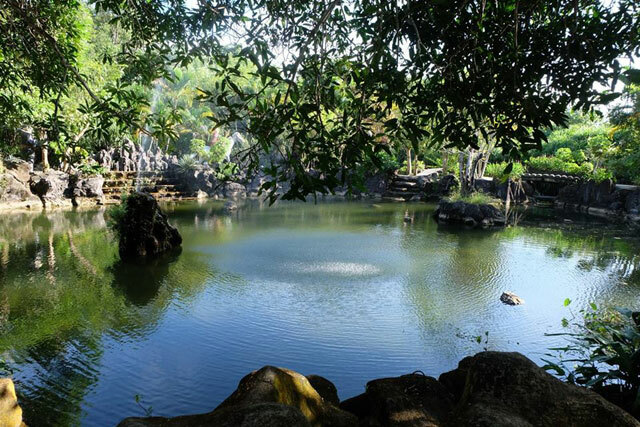 On the afternoon of December 2nd, the members organized a picnic in Suoi Tranh area, where has fully charming scenery, mysterious caves with many beautiful stalactites, creating comfortable, relaxed space interweaving between the smooth green of grassland and flowers, leaves trees. Leaving Suoi Tranh, in the evening of the same day, the members had a friendly, warm atmosphere at Ngu Uyen restaurant. The joy of the members of 2 units was multiplied and heated by Chairman of Board , Chairman of the Advisory Council, Directors of the Branches, Chief auditor, Secretary of the Party Branch, Chairman of Union and Directors and Deputy Directors of departments of VinaCert were also in Phu Quoc for working trip on this occasion. Mr. Nguyen Huu Dzung, Chairman and Director General of VinaCert giving gifts to Mr. Pham Van Trieu Anh, Director of Center for Application of Science and Technology Advances of Phu Quoc Branch. 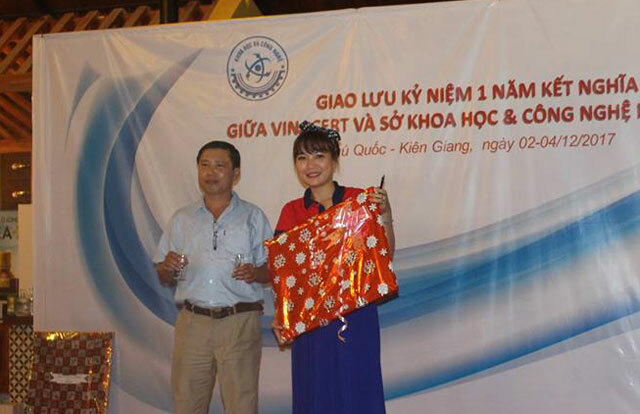 On the occasion of the Kien Giang Department of Science and Technology newly established Center for Application of Science and Technology Advances of Phu Quoc branch, VinaCert's Board of Directors had a meaningful gift to the leaders of the Kien Giang Department of Science and Technology. Mr. Nguyen Thai Nguyen, Deputy Director of Kien Giang Department of Science and Technology presenting gifts to Mrs. Nguyen Thi Hue, Director of VinaCert branch in Can Tho. 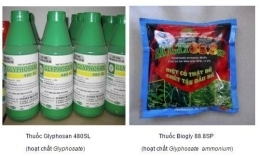 Expressing the gratitude to VinaCert’s Board of Directors for the good spirit and the effective implementation of cooperation between 2 units in the past year, Mr. Nguyen Thai Nguyen, Deputy Director of Kien Giang Department of Science and Technology also had a Gift to VinaCert’s branch in Can Tho. 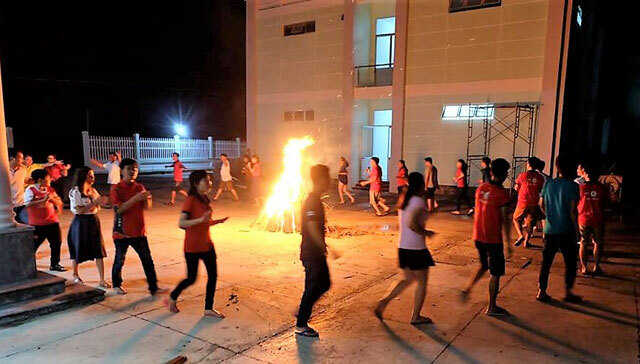 The joy, the laughter and the stories of 2 units were continuously connected, intertwined by the fun games, the songs showed by enthusiastic hearts of the members in campfire night at the Center for Application of Science and Technology of Phu Quoc. Continuing the program, on December 3rd, the members had a opportunity to implement interesting fishing, squid fishing voyage, process directly and enjoy seafood caught between the strong wind and great waves. The program of exchanging 1 year anniversary of 2 units is not only a chance for the members to meet and exchange, but also to review the memories and achievements. This is an important premise for the leaders and staffs of 2 units to further strengthen mutual coordination and support to successfully complete the tasks in 2018 and next years.